This summer give yourself and friends an original work of art. 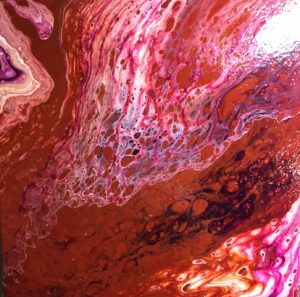 Fluid painting involves layering acrylic paints of different densities and incorporating certain additives (i.e. silicone, dimethicone, alcohol, Dawn dish soap (etc.) which can result in gorgeous combinations of paint, cells, and lacing. Techniques include the flip cup and the dirty pour.! No experience is necessary. Cost: $40 + $20 material fee paid directly to instructor. Teaching Artist, Pauline Clifford, is not an artist by vocation or profession. She is an educator, currently focused on technology infusion in the classroom. Pauline serves as Director of Educational Technology at Quinebaug Valley Community College. In an adjunct capacity, she also teaches English. Pauline delved into the world of jewelry making at the prompting of friends. Although she started with basic bead stringing and wire wrapping, she’s moved on to bead embroidery that incorporates Soutache braid and Shibori silk. Pauline makes jewelry that she likes to wear, favoring bold statement pieces. Color and sparkle appeal to her but so do graduating colors in the same area of the color spectrum. She seems to start a piece with a general idea of what she’d like to produce in terms of placement and color. Pauline is not comfortable tethered to a rigid pattern; she likes to see where the beads and cord and wire take her. Pauline earned a Bachelor’s degree in East Asian Language and Literature, a Master’s degree in Language and Literacy, and a Ph.D. in Educational Technology.